When I tell people I’ve traveled to Thailand, Singapore, Ireland, France, and more last year, they usually just look at me in awe. 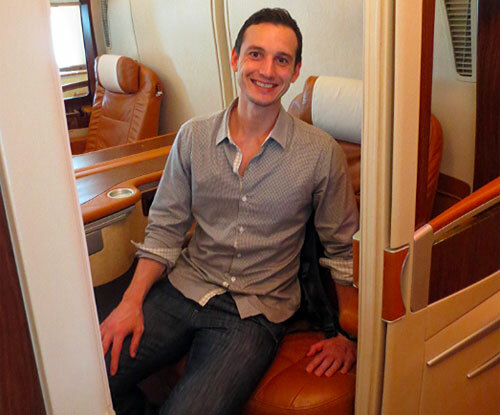 People really start looking at me strangely when I tell them I flew to Thailand and back in 5 days, just so I could fly in a suite on Singapore Airlines! That’s normal, right? I don’t say this to make me look cool or feel good about myself, because the reality is there is nothing special about me. I mean, I’m pretty good at Fantasy Football, but I don’t think that counts. The truth is, I’ve always wanted to travel. 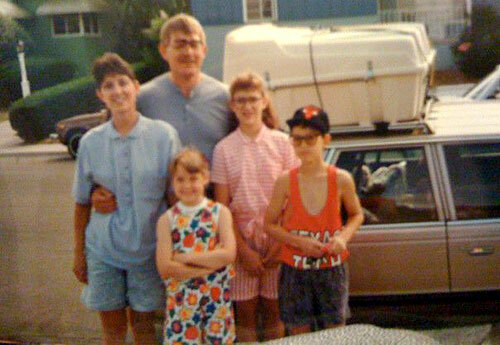 Even from a young age I loved to get in the station wagon and just GO. But until a few years ago, I didn’t have the means to make it happen. It’s not until I learned how to leverage my credit safely (quit looking at my guns), that I unlocked the keys to traveling the world for a price I can afford. Now I get to spend my days traveling and writing the blog, , where I teach others how to do the same. I’m very grateful to do what I love! When my wife and I got married, I thought we’d have to save for 5 years to be able to afford a trip to Tuscany, Italy. Her dream destination. I mean, tickets to Europe are usually a couple G’s. A PIECE. Everything changed when my buddy introduced me to the beauty of traveling with frequent flyer miles and points. The currency to see the world. The next thing I knew, my wife and I had each signed up for a basic United Airlines credit card and practically covered our flights to Europe. That’s because many rewards cards offer lucrative sign-up bonuses just for getting the card. And since I have an addictive personality (yeah, addicted to chap stick) I was hooked. It didn’t even matter that we spent a night homeless in Florence because the parking garage closed at 7 pm (WTH). But it definitely added to the adventure, and it’s a highlight from the trip we still talk about today. Fast forward a few years, and we have accumulated enough miles (takes less than you think) to fly First and Business Class. You can get to Europe in business class with practically TWO rewards credit cards. That’s c r a z y value. For example, we just flew back from Europe in Lufthansa First Class – an experience that would have cost us well over $10,000 a ticket! Insanity. And we were even driven to the plane in our own Mercedes. That’s definitely not something I ever envisioned happening, but miles and points have not only made travel more attainable, they’ve made traveling in style possible. My main concern when my buddy told me that he applied for multiple credit cards and used the rewards earned from them to travel the world was…. It was my initial thought, so I get it when people are skeptical at first – they should be. Your credit score is extremely important. That said, if you’re not responsible enough to pay off your credit card bills in FULL and on time, this ISN’T for YOU. Seriously, if you can’t manage your spending or payments, applying for and using rewards credit cards shouldn’t be a part of your life. But, if you can responsibly manage your accounts, then there’s a TON of value in rewards credit cards and loyalty programs. Here’s what happens: When you apply for a credit card, there will be a 2-5 point ding on your credit score for the initial inquiry. The inquiry is to see if you’re credit worthy. The good news is, your credit score will bounce back, and in some cases improve, as you add positive credit activity over time. Positive payment history and a lower credit utilization (what happens when you raise your overall credit limit, but not your spending) will help to increase your score. A lot of people think canceling cards will hurt their credit. I did. But that’s only if canceling a card raises your credit utilization (because you’re lowering your available credit, thus using more of it) or shortens your average age of account. Here’s the deal. When you cancel a card, it will still stay on your credit report for 10 years, so it won’t affect your average age of account. But never cancel your oldest card. You should keep that card open FOREVER. As for other cards, I always try to downgrade any cards I’m considering canceling to a no annual fee version if possible. And if I have another card with that bank, I always transfer over my existing credit limit to that card, so that keeps my credit utilization the same. Winning. This also gives me some credit limit to play with if I’m applying for another card with the same bank in the future. Still, many rewards cards are worth paying the annual fee on, since they have a lot of perks! All of this may sound confusing, but once you digest it, it’s really simple! I promise. As far as managing multiple credit cards, that can take work. So I highly suggest looking into a software like Card Watchdog to help you stay on top of your credit cards’ fees, perks, and changes. This helps simplify things, so you can just enjoy the rewards. Once you have rewards credit cards, there are numerous ways to maximize their points earning potential. Here are a few of the tricks I use to earn mega points. #1) Gift Cards. I buy gift cards that earn me at least 5x points per $1 and then I use those gift cards for everyday purchases. Many rewards cards have category bonuses for purchases at grocery stores, gas stations, and office supply stores. I simply go there, load up on gift cards, and then use the gift cards for my everyday spending. I want EVERY dollar I spend to earn multiple points, miles, or cash back. Is it greedy that I want my hard earned money to s t r e t c h? #2) I apply for business cards. I have a few online businesses and side projects, so I’m able to apply for business credit cards. TIP: You don’t have to be incorporated to apply for a business rewards credit card. You can apply as a sole proprietor. Easy. Business credit cards are great for a few reasons. All credit activity besides the initial inquiry will be tied to the business credit report. This leaves your personal credit score practically unscathed. Just don’t default, but if that’s even a question – DON’T apply. Business cards have the best rewards. You can easily get $550 cash back or 55,000 points by just applying for one business card. And the category bonuses on business rewards cards rock. #3) Amazon Payments. Amazon Payments may be the greatest thing since they started bottling beer (ok maybe that’s a little too far, but it’s awesome). With Amazon Payments, you can send $1,000 a month with a credit card to another person for free. This helps my wife and I spend $2,000 more a month. That’s nifty. Here’s the post on my blog that gives you step by step instructions for Amazon Payments. Rewards credit cards and loyalty programs have helped me travel like I never thought possible. It’s just that simple. I never thought I would be able to travel to Europe, Asia, or Hawaii multiple times in a year, but now that’s a reality in my life. And it should be in yours, too! If you have a good credit score, can manage your credit card spending and pay your bills in full and on time, there’s nothing holding you back from being able to do the same. Give it a shot! Feel free to to send over any questions you have in the comments below. I’ll be checking in and out for J. Money while he takes a break today! Geoff Whitmore is lead traveler/writer at , a blog dedicated to educating its readers on reward travel, travel tips, and cost-saving travel techniques. The blog particularly focuses on new travelers (or as they like to call them, “Noobs”), and it teaches its readers how to save BIG. All the while, the site maintains a humorous writing style that is both fun and informative. I’ve been intrigued by “travel hacks” for a long time. I may have to get into it. My wife likes to travel… and I like to save money… so…. it seems like there may be a natural connection somewhere. That is awesome as I started learning about travel hacking from blogs. You get way more value overseas for your points. A Marriott hotel level 7 is 35,000 points and usually costs around 200-250 a night, in Hong Kong for the same points our hotel was $700 a night! I woud never pay that much for a room. Wow, the gift card and Amazon payments tips are two I’ve never heard of before. I have to admit this is something I’ve yet to dive into, but all of the proponents definitely make me feel like I’m missing out. Thanks for sharing your story! We’d always been a fan of cash back rewards cards, but this year we’re trying to accumulate some miles to extend our travel spending a bit. Thanks for asking this, Mrs. Pop! This was a great article, and I hadn’t heard of the Amazon Payments tip before.. but it seems like one of those too-good-to-be-true things. Is there any catch? Great question! Amazon will only report the transactions to the IRS if you do more than 200 transactions, or $20,000 in a calendar year. We have never had more than $12,000 in transactions (each) in a calendar year. My wife and I have been doing this for a handful of years without any issues. Hope this helps! The Amazon tip is awesome – thanks. I’m surprised that credit card companies haven’t picked that loophole up! They will, this is getting mentioned more and more and will likely go the way that coinbuying for travelhacking did. Oh man, I remember that whole coin buying thing – it was right when I started blogging and EVERYONE was trying to take advantage of it! I didn’t have the cajones to (also, I was lazy), but I love it when people figure out something and then just jump on it. Smart humans out there. Hmm, I wonder if Amazon payments exists up here in Canada. I’m definitely going to have to look into it! It sounds like you’ve managed to do a great job of maximizing all of the rewards cards out there! US sign up bonuses seem to be better than Canadian ones, but it may be time to look into a new card sign up again for me. Thanks for the information, I will look into Amazon payment !!!! Great post Geoff! Definitely an interesting idea. Do you carry a balance each month on any of your cards? I’m glad you liked the post! I rarely carry a balance on a credit card. If you’re paying interest regularly it negates the value of the rewards you’re receiving. I just dove in to travel hacking, but have a long way to go. Thanks for this post and I am definitely checking out your website! All great tips! My wife and I are planning to pay for our 2-week honeymoon with just points and miles. It’s nice to travel for free essentially! Great tips, travel is awesome. I once lost 30K delta sky miles points, so do not sign up for their card because their points expire. Finally something on this, though there are actually many more ways to optimize things than the post implies, like the 60x mags for miles with AA recently. Or if you’ve got a business with substantial spend: SPG AMEX. I’ve been doing this stuff for ages and just scored some First Class flights with Etihad to Maldives (J from AUH to MLE and F from IAD to AUH) for the family. Of course we stay mainly at St. Regis’ and Four Seasons, which are pricey, but our budget allows us this or we often use points for the St. Regis. The alternative, would be to stay at SPG/Hyatt properties for free. We’ve also got a Thailand through CX on J coming up, and a Bali on CX on J in the works, and a free 10 nights at the St. Regis Punta Mita. Earning and burning about 1.5 million SPG and AA points/miles a year…. This stuff works. I know when I’m out of my league here when every time you’re talking about a leg of a trip there and say “J” I think you’re talking to me ;) Happy new year, bud. wow. wow. wow. I have been so interested in signing up for rewards for traveling. thanks for the info! That’s great! There’s nothing like traveling with someone in style for a price you can afford. I addressed the AP questions above, and you can find the answer in my post too. Let me know if you have any additional questions! I have heard of doing this and know people that basically paid for their honeymoon by doing this with all their wedding expenses but my credit right now is AWFUL and I can only get a secured credit card with a $300 limit due to my low income and high student loan debt :( I’m hoping in a few years when I’m making more income (hopefully) and pay down some debt I can qualify for one of these cards and save money on travel and gift cards. This sounds both fantastic and like a ton of work. My main credit card is an airline card, and I certainly use it for travel, but I don’t have multiple credit cards nor do I do all these tricks. I’ll have to look into it! Geoff, your insight on this stuff is incredible. I see you offer a live chat on your site… Would you be ok if I complied a list of newbie questions for you and we chatted a few of them out? Ready to take the plunge! Thanks for the kind words! Yes, don’t hesitate to email or chat anytime. Oh, I love this post! Brad from Richmond Savers is starting us on the path of travel hacking, and he’s found us a way to get 16 nights in 4 European cities, for free, on just two cards. Next up: your blog, for flights! Thanks! Never heard of the Amazon payments but must try it! Really great post and will be looking into all these hacks in the near future! Credit card-based travel hacking is largely an opportunity for people in the U.S. The cards issued by banks elsewhere in the world aren’t nearly as incentivized as those in the U.S. Which means for us Canadians there aren’t quite the same opportunities to do this. Also no Amazon payment here either. This is the first I’ve heard of it, sounds like a great way to churn credit cards. Can you earn cash back while doing this too? If so that would be awesome. I can’t believe more people don’t use and abuse this system and put the banks out of business?! Uk rewards are much more conservative but it’s still worth doing. If I get paid £100 a year for making normal purchases then I’ll take that thanks very much! Can’t seem to find a similar Amazon service over here either though, but I’m not so sure I’d be comfortable doing that anyway. Credit card companies like Visa, MC, Amex, and Discover make a BOATLOAD off of the businesses who accept them in the US. I work at a private school and we are still charged 2.5% of each transaction in spite of the fact that we’re a non-profit. So when someone pays the $9,500 tuition bill on their Visa, the credit card company makes $225 off of that swipe. Without laws to reduce how much a credit card company can charge a merchant, credit card companies in the US make enough profits to offer rewards. True enough Tara. I’m certain the same applies over here in the UK though so wonder why the bonuses are so much bigger over there? Weird! Wow, people pay their tuition on credit cards?? I guess all those who have rewards/cash-back cards :) It’s crazy how checks have almost gone out the window with our (the younger) generation. Many colleges charge a fee equal to what the card is charging the college to use it. So many points savvy folks don’t do it any more because tuition is now 2.5% (or whatever) more expensive. Nice information here. The one thing I have a question of is about getting business credit cards. If you are a sole proprietor, you still have to use your social in order to get the credit card. Is this not the case anymore? Great question. Yes, you can apply for a business card as a sole proprietor. You will use your social security # instead of an EIN. However, even if you are incorporated the approval for a business card will be tied to the person applying (and their s.s/credit score). So either way you have to put your social security # on a business application. All other credit activity like average age of account, opening, credit limit, and closing will be tied to the business. Of course unless you default, but that should never happen. I hope this helps and let me know if you have any additional questions. Aw man. I’m always so excited when I read posts like this but it always comes back to credit cards rewards! We just don’t have options like this in NZ. You don’t get charged if it’s under $1,000, I promise. I do this too. You and both the recipient do need to input their SSN’s though, probably to track any forms of money laundering. I just tested this and I was able to send $500 using my rewards credit card with no fees. Thank you! For example, I would imagine that a person who spends $4,000 monthly on his credit cards and pay them off monthly will accumulate points and miles way quicker or better and can fly first class and get Mercedes rides than a person who spends only $400 or $40 monthly? Yes, and no. You will definitely earn more miles & points the more you spend, but you can rack up a nice stash of rewards points by applying for the right cards with the highest sign-up bonus, and by maximizing their category bonuses. There are also many other ways to earn points – the post shares just a few beginning tips. Nice work on the post, informative for noobs to get started! I’m a frequent user of miles for travel. I don’t think it would have been possible otherwise. Speaking of mileage cards and never cancelling your oldest account, I have a question for everyone. My husband’s oldest and only lasting credit card is an Alaska Airlines card. Since opening that account, he’s had auto loans, mortgages, etc. I hate paying the annual fee but that is his oldest credit card by probably about 10 years. What is the best thing to do? If it makes any difference, the Alaska card is through Bank of America. I wouldn’t ever cancel it, because it’s great for his credit history. However, you may be able to downgrade it to a no annual fee card and keep it’s credit history. Just call the # on the back of the card to see if that’s a possibility. I didn’t realize you didn’t have to be incorporated to apply for a business card. Hmmm, my blog might just let me gain some more money than I already get from churning credit cards. Although my focus has been more on the cash back bonus vs the flyer miles. I don’t have a lot of vacation time to go traveling around the world. Nice. We’ve been racking up the rewards from credit cards for a while now. I love free money. And free travel. I regret not getting in on this earlier…I did get some get in on the Chase Sapphire and Citi Premier…got 2 free roundtrip flights and a luxuries stay at the Hyatt. Now with a little infant and looking to buy a place…no churning for us… it’s tough traveling with kids. But with free travel…still gonna try. I love travelling and when you can do it on a dime it’s even better. I try to always book my flights with United because I can collect miles and stay at Hilton or Marriott hotels because they are awesome, always in awesome locations and I can collect points for free nights. Love it. I am about to go get ridiculously addicted to your blog. I LOVE traveling – it was a major aspect of the last two jobs I had, and as fond as I am of the stability of my current job and actually seeing my family once in a while… I miss adventures. Me too :( I find it harder to take adventures now that I’m self-employed and also have babies coming out left and right… I wouldn’t change it for the world, but I still miss those fun – and far – adventures! I’d never heard of Amazon payments, I think I’ll start paying my rent that way! I’m just getting started on travel hacking. I recently signed up for my first credit card with a big initial bonus offer, gonna use those miles to get to Europe. I really need to take advantage of all of these travel rewards credit cards! Definitely going to check his site out. I’m just now getting into the travel hacking game, as I’m trying to save costs on moving back to the US this year (and hopefully take a trip to Germany in 2015). Geoff, what cards do you use that earn you 5x points on gift card purchases, and that earn points on Amazon payments? I applied for a Gold Delta SkyMiles American Express card to earn their sweet signup bonus (30k miles), but AmEx doesn’t consider gift cards or Amazon payments eligible to earn points :( Would love your input on this. The Ink Plus and Ink Bold earn 5x at office supply stores, so you can earn 5x with them on gift cards bought at Office Depot, Staples, Office Max, etc. I know you don’t want to hear it, but there are better offers for the Delta Gold card. :-( Don’t hesitate to email me before you apply for a card. I’m always happy to help! Wow that amazon payments idea is amazing. I currently have a land contract for an apartment building and I’m gonna try to set up my payments this way to get the credit card rewards. Awesome! MIND BLOWN with Amazon Payments. To make sure I’m not completely ignorant: you are essentially just shuffling your money around between bank accounts (if it is going from you to your spouse for instance or from you checking at one bank to your savings at another bank) but the money is getting charged to your credit card and you can just pay it back to the initial account. That is a CRAZY awesome way to rack up points on credit cards!! Just got back from the EU, points and miles, 3 of 5 flights were business class. Our room was upgraded with wifi, full breakfast each morning, full happy hour with unlimited beer and wine with hot and cold appetizers/dinner. We got the points from Marriott’s black card and 58 room rentals in a year. Miles from job. Trip was valued at minimum of $18K. Wonderful romantic tour and came back home not in debt!! Hooray! Holy crap – NICE WORK! Would love to buy a property in Cape May, Cape May Court House, etc., rent it out, and be one of a few investors. How would I get info on this? I don’t want a timeshare, just an own share! That sounds interesting indeed :) I don’t personally know myself, but I bet some good time on Google might help? Or maybe just call local realtors over there and ask them directly? That might get you an answer even quicker.